R.Lalique Catalogue Raisonne 2011 Felix Marcilhac: Brand New 2011 Edition of the book R. Lalique Catalogue Raisonne De L'oeuvre De Verre by Felix Marcilhac. Nearly 4000 Rene Lalique glass items shown in photos in 1064 pages. The book weighs around 12 pounds and is 31 cm by 24 cm by 8cm. Newest, most complete and updated edition released September 2011. ISBN 978-2-85917-510-8. FREE shipping postal media mail (or UPS - our choice) in the 50 United States and Puerto Rico. Post office boxes require advance approval before shipment. Most addresses in Australia, Japan, France, England, and Germany are $110 for air shipping. Canada is $75. The shipping box total weight is about 16 pounds. For international shipments, email your address details including postal code for a shipping quote. The Stock Number is 938. Here is a link to Payment Instructions and shipping information. 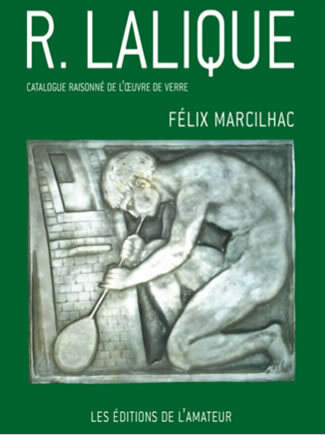 And here is our announcement about the 2011 Edition of the RLalique Catalogue Raisonne $325.